Sometimes my patients ask me what foods are good for their skin, to keep it firm and younger looking. I tell them whatever you eat that’s good for you is good for your skin. 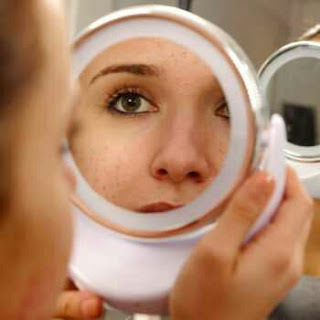 Your skin is a reflection of your overall health. If you’re healthy inside, you’re healthy outside. Omega-3 fatty acids do a lot of good things, including lowering your triglycerides and battling inflammation. Though most plant-based foods — veggies, nuts and oils — don’t provide as much omega-3 as fish, they’re still a solid source. Flaxseed oil is particularly rich in the collagen-boosting fatty acid. Don’t cook with flaxseed oil; mix it intosmoothiesor yogurt, or use it as a salad dressing. Eat fruits and veggies — plus chocolateFruit, vegetables and dark chocolate supply antioxidants and vitamins that help protect your skin from free radicals and sun damage, which keeps the skin looking younger and moreradiant. I’ll start with tomatoes (yes, technically a fruit — but used as a vegetable in cooking). Tomatoes contain lycopene, an antioxidant which can help keep your skin smoother. And you know tomatoes are easy to work into anything: salads, side dishes, sandwiches. Other fruits and vegetables not only contain antioxidants but healthy amounts of vitamins C and E, which can fight wrinkles. As far as chocolate goes — and a lot of us would follow it anywhere — dark chocolate contains flavonals that can reduce rough texture in the skin and protect against sun damage. Have a few ounces a day, but make sure it’s made up of 60- to 70-percent cocoa. Watch serving sizes and sugarA lot of the things that help your skin are healthy for you to eat. Eat plenty of fruits and vegetables, but still watch your serving sizes; fruit has a good amount of sugar. And cut down on the unhealthy junk. You’ll feel better and look better — and your skin will reflect it all.